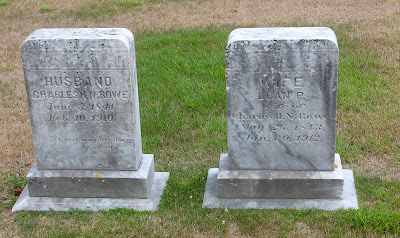 Samuel and Hannah (Sawyer) Hilton are buried in the Upper Gloucester Cemetery in New Gloucester, Maine. 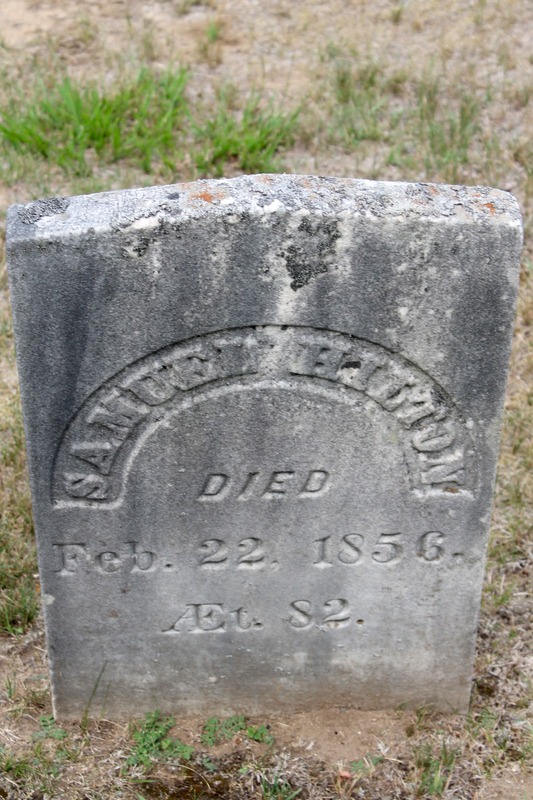 Samuel was born about 1774 and died on February 22, 1956. 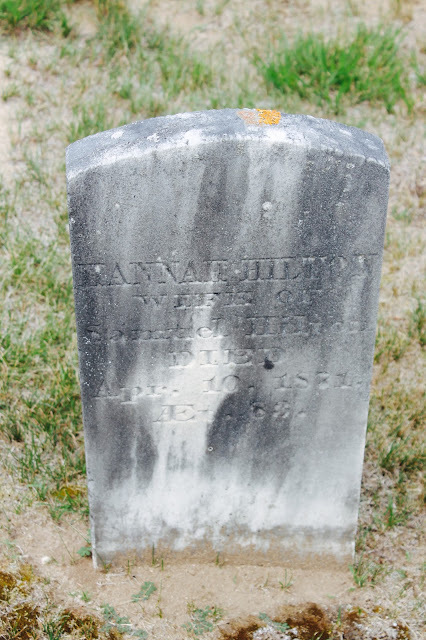 Hannah was born about 1788 and died on April 10, 1871. They had two daughters and probably other children. There is more research to be done on this couple. 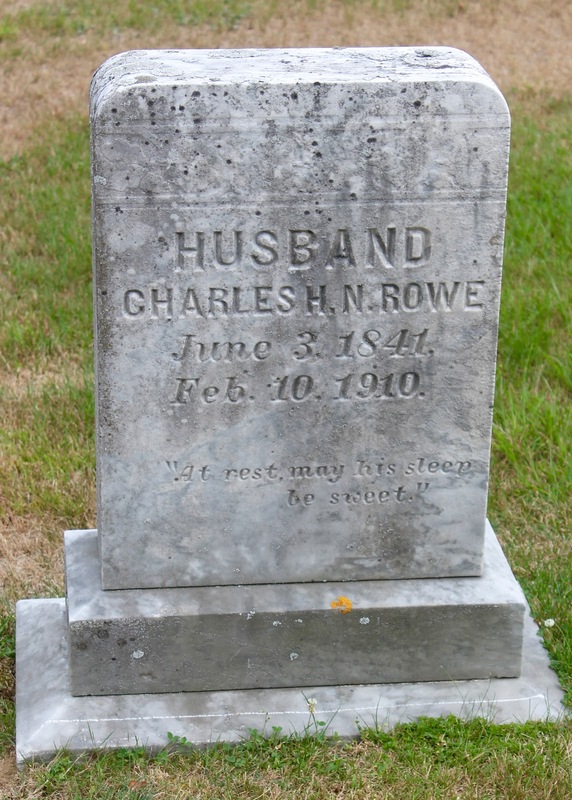 Their grandchildren, Charles H. N. Rowe & Loan Parsons Churchill married each other creating a double line of descent. Catherine (Hilton) Churchill was born on July 24, 1813 in Solon, Maine. Her parents were Samuel and Hannah (Sawyer) Hilton. 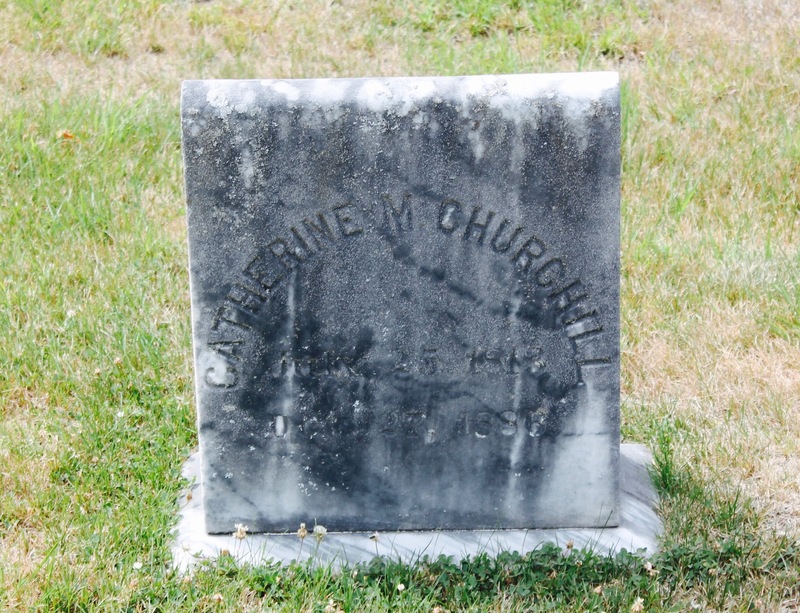 Catherine was married on March 27, 1832 in New Gloucester, Maine to Josiah Churchill, Jr., son of Josiah Sr. and Lydia (Orr) Churchill. He was born on May 22, 1809 in New Gloucester, Maine. 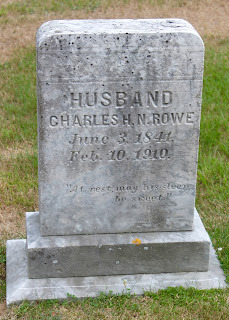 His grave is unmarked but presumed to be in the same cemetery as his wife, Catherine. Sarah Rogers Churchill was born on April 10, 1833 and married Nicholas Jordan. Joseph Fessenden Churchill was born on July 1, 1837 and married Sarah Smith. Hannah Churchill was born on August 21, 1839 and married Daniel Yeaton. Marshal Churchill was born on September 25, 1842 and died on March 10, 1843. 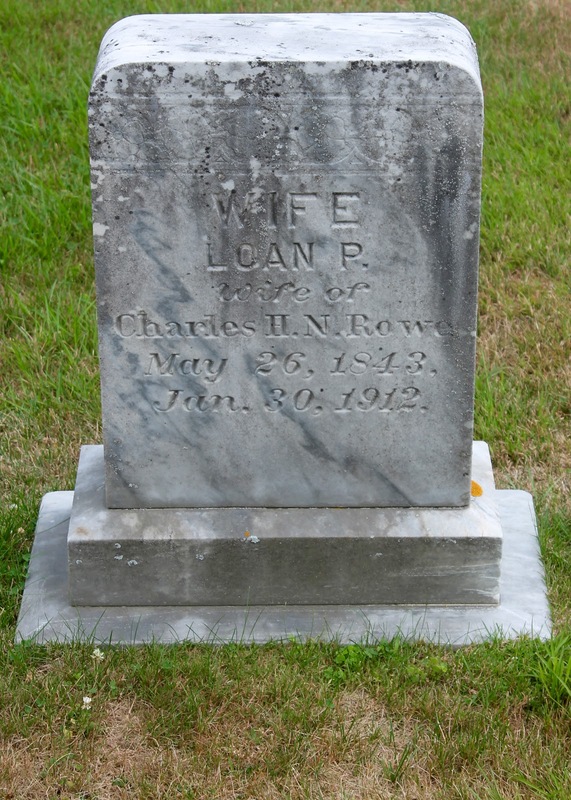 Loan Parsons Churchill was born on May 26, 1844 in Raymond, Maine and died on January 30, 1912 in New Gloucester, Maine. She is buried in Upper Gloucester Cemetery. Taylor, Robert L. Early Families of Raymond, Maine. Bowie, Maryland: Heritage Books, Inc., 1998. From A History of Otisfield p. 589 (see citation below). "They (the Spurr family) moved from Dorchester to Wrentham, previous to 1774 and lived there seven years. It is said they lived in Mansfield, Me. or Mass. for a time. They came to Maine in 1776 and lived one year in Saccarappa, a year and a half in Windham, and moved to Otisfield, September 3, 1779. They settled on lot 16 a little south of Spurrs Corner on the west side of the road. Some lilac bushes and the ruins of the old foundation remains (1930). John Spurr lived in the house afterward and then Joseph Knight moved it to his place on the opposite side of the road and occupied it for a woodhouse. It is said that the first night they spent in Otisfield, they camped beside a large stone near the road. 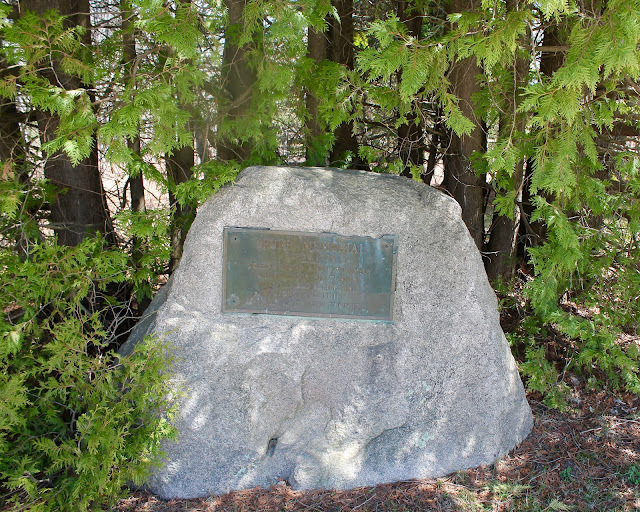 (A portion of that stone has since been moved to Spurr's Corner and a memorial tablet placed upon it.) He is buried in the yard south of Spurr's Corner. Through a mistake of the stonecutters the name is spelled Spyrr, instead of Spurr. They had nine children living, all born in Dorchester, and all came to Maine unmarried. 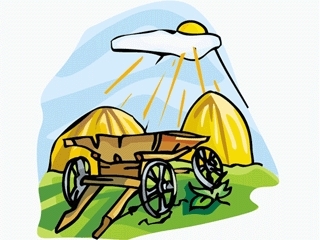 They came to Windham in an oxcart and were the fourth family in town." **Going to Otisfield to photograph the stone and tablet is on my genealogy road trip list. I got a picture of this memorial in April 2016. 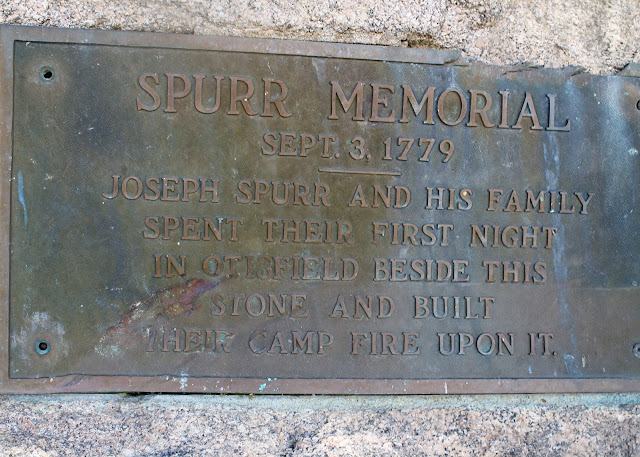 "Spurr Memorial Sept 3, 1779 Joseph Spurr and his family spent their first night in Otisfield beside this stone and built their camp fire upon it." Joseph Spurr was born November 19, 1731 in Dorchester, MA and died June 17, 1805. He married Miriam Lyon on September 13, 1753. 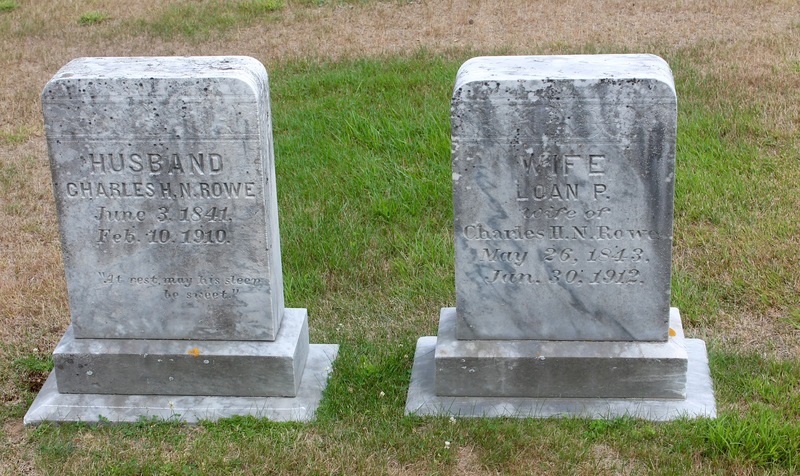 They were my 5th great-grandparents. Enoch Spurr b. January 28, 1761 in Dorchester, MA married Abigail Wight b. May 31, 1767 in Wrentham, MA. Roxanna Spurr married Edward Stanley on November 2, 1815. Mary Frances Stanley married Augustus Mellen Carter. Edward Mellen Carter married Fannie May Capen. T. Richard Carter was my grandfather. Spurr, William Samuel. A History of Otisfield: Cumberland County, Maine from the Original Grant to the Close of the Year 1944 by William Samuel Spurr. Otisfield, Me. : Published by the Otisfield Historical Society, 1994. PDF. My great-aunt, Rebecca Williamson "Becky" Carter, was named for her grandmother, Rebecca Williamson. 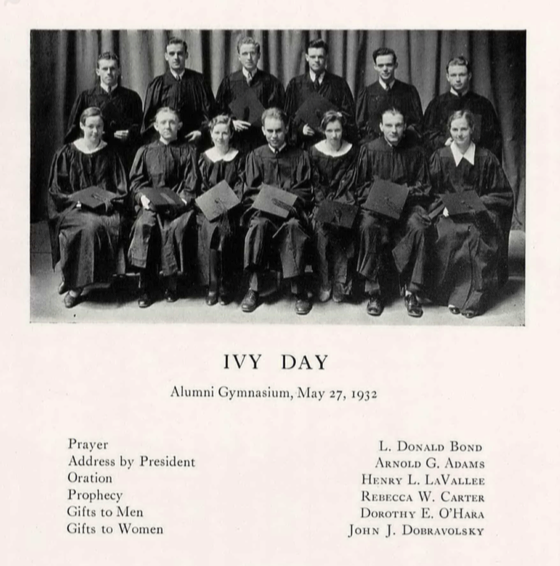 In 1933, Aunt Becky graduated from Bates College with a degree in English. 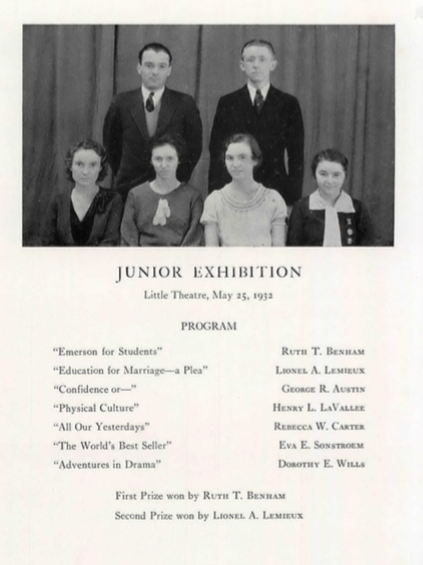 Her biography in the yearbook notes her activities and includes a little statement about her. "A delightful imagination in her creative writing and excellent debating ability combine to make Becky a puzzler to the professors. A good sport, a lover of literature, Becky is a delightful person to know." I love the little blurb about her at the end! Her activities included the debate team, women's student government, Junior Exhibition, Ivy Day speaker, chairman of the Y.W.C.A. Bazaar and a member of the Class Day Committee. Becky also was part of the theater group known as 4-A. She was inducted into the Forensic Honor Society, Delta Sigma Rho. Becky gave the prophecy. She is seated in the 5th seat from the left. Rebecca Williamson Carter married Bruce B. Bailey in 1942. They lived on a beautiful farm that they called "Skyfields." She was my grandfather's only sister. Another great find from Chris Dunham, of The Maine Genealogy Network! 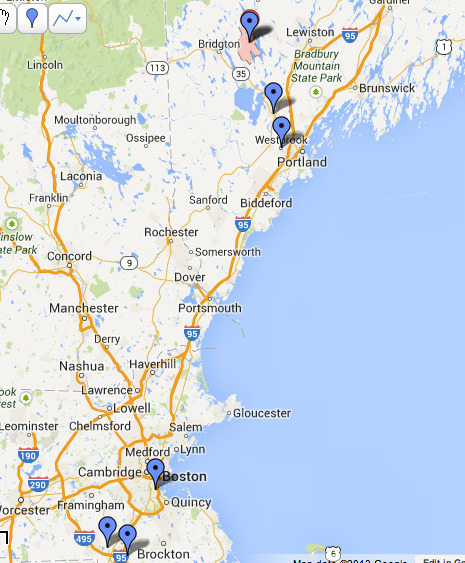 If you have Maine ancestors, this site is a great resource. Chris has helped me several times before and is always willing to help brainstorm a genealogy conundrum. 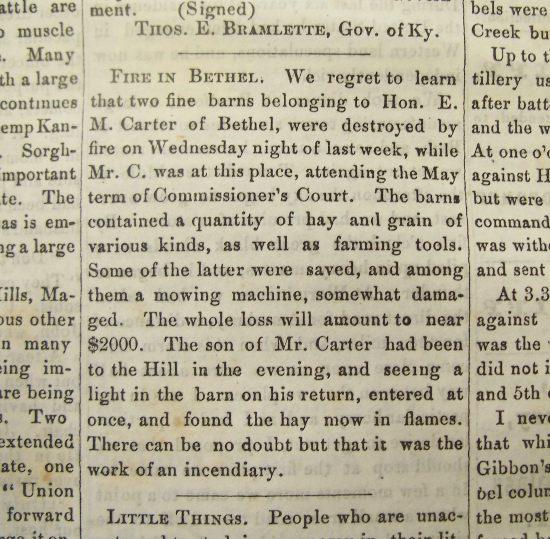 This snippet in the newspaper, The Oxford Democrat, published on May 20, 1864, describes a barn fire at the home of my third great-grandfather, Elias Mellen (E. M.) Carter. Two barns with hay, grain, and farming implements were lost for a total estimated loss of $2000. One inflation calculator estimates that would be $30, 260 in today's dollars. The article says the fire was spotted by his son who spotted the light from the fire. There were several sons in the family. It could not have been my second great-grandfather, Augustus, because he was serving in the Civil War in 1864. It could have been Edward, age 20, Timothy, age18, or more unlikely, John, age 10. The Carters lived in Bethel, Maine in a section by the Androscoggin River, known as Middle Intervale. In September 1861, the family lost five daughters in seventeen days to diphtheria. 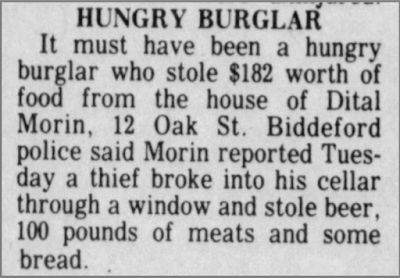 While researching my ancestors, I come across interesting stories that have nothing to do with my genealogy but they make me chuckle. This is one of those small stories. 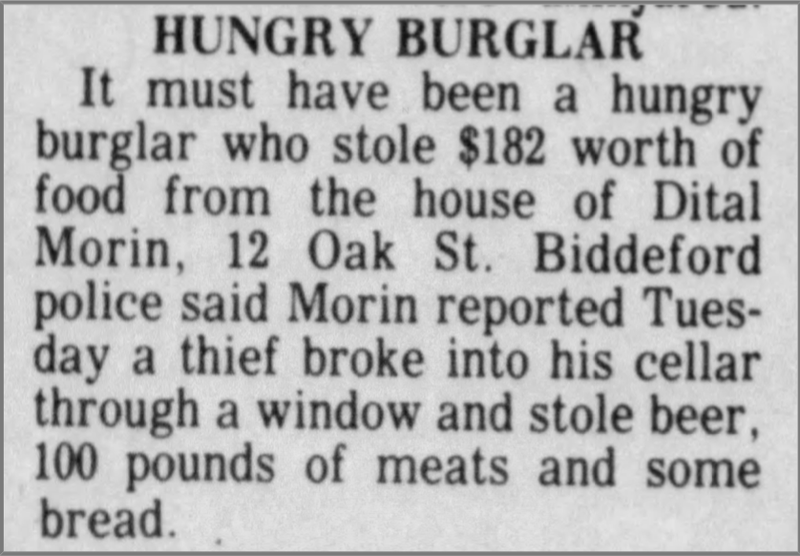 I guess the man must have been craving sandwiches since he stole bread and meat. Of course, he needed something to wash it all down and luckily, there was some beer handy.